A Star Is Born again. 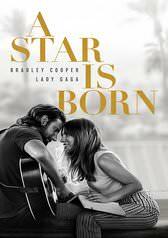 Movies that share the same name usually come from a franchise, but the A Star Is Born movies aren’t sequels or even conventional remakes. They’re more romantic revivals that happen every couple of decades when filmmakers & actors take the same template & narrative threads but put their own special sauce on them. The central theme is always an alcoholic male artist on a career downswing who helps to raise (and also hurt) the profile of an up-and-coming starlet, though there are other hallmarks: Star Wars movies have light saber battles; A Star Is Born has a guy telling a girl, “I just want to take another look at you.” The rest is what defines each in the canon of filmmaking. The newest take adds nuance & character development that’s missing from its predecessors. Plus, it’s a great modern cautionary tale. Getting his drink on after a show, country rocker Jackson Maine (Cooper) is smitten when he hears waitress Ally (Gaga) in a drag club. After a night discussing life & songwriting, Jack has her flown to a gig, where she becomes a phenom when he brings her out to sing. Ally hits the road with Jack & begins a journey toward stardom. Jack suffers from hearing loss & one unfortunate alcohol-fueled episode after another. In the director’s chair, Cooper unleashes surprisingly good vocals & an emotional performance. Gaga is at the height of her acting powers and (like Garland) she takes over the film when she starts to sing. The original tunes are all superb. The fourth time is the charm?